PLEASE NOTE: Since this article was published, Spriggs' conviction was reversed by the 5th District Court of Appeal. However, any form of distracted driving may still result in a traffic ticket. Distracted driving has been catching the attention of lawmakers countrywide. Today, 20% of US states ban hand-held cell phone use while driving, while another 80% ban texting behind the wheel, altogether. But what about using your smart phone GPS while driving? Some argue this falls outside of the realm of distracted driving laws. One California court disagrees. California driver Steven Spriggs faced the Appellate Division of the Fresno County Superior court last month to find out whether he truly was in violation of the state’s vehicle code outlining the legality of using wireless devices, i.e. cell phones, while operating a motor vehicle. "A person shall not drive a motor vehicle while using a wireless telephone unless that telephone is specifically designed and configured to allow hands-free listening and talking, and is used in that manner while driving." Spriggs was found guilty in April 2012, and later appealed the verdict; his appeal was unsuccessful and the court confirmed his original conviction judgment in March 2013. Hands-Free Cell Phone Use: Listening, Talking, and ... Mapping? Many Californians undoubtedly are familiar with the state’s laws regarding using cell phones while driving. Often referred to as laws to prevent “distracted driving,” these regulations forbid drivers to use their cell phones while operating a motor vehicle, unless they employ a hands-free device (usually). However, much of the confusion in Spriggs’s case focused on the word “using” (“while using a wireless telephone”); according to published court documents, the court admits “using” is not clearly defined in the statute. Could accessing a GPS or mapping program with your cell phone, while the cell phone is in your hand and you’re driving a vehicle, constitute “using” the phone? The appellate court decided yes, and determined Spriggs was in violation of the vehicle code, largely because the code doesn’t state it applies to holding the device for conversation only. Spriggs was holding and using his cell phone while driving; thus, he was guilty of violating the code. Had Spriggs’s cell phone been fastened on a dash dock, the story might have turned out differently; that’s because, even though California has a hand-held ban for texting, talking, listening (and now, using GPS), it doesn’t prohibit hands-free cell phone use. 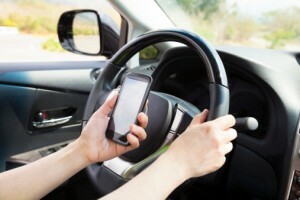 California is just one of many states to enact some form of distracted driving laws; according to the Insurance Institute for Highway Safety, 10 states currently ban hand-held cell phone use, while 39 states ban text messaging while driving, period. 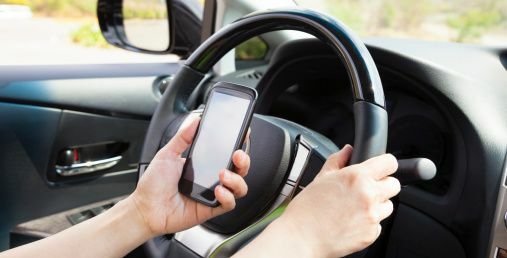 Despite the number of states passing distracted driving laws, opinions on the California appellate court’s decision regarding Spriggs and his GPS use are mixed. While several of DMV.ORG’s Facebook fans disagree with expanding laws to include GPS, the vast majority support it. One commented that, "It should not be safety first but safety always," while another asserted that fines for hands-on use are just another way for the government to generate revenue or get involved in their lives. "I know how to conduct myself and make the right decisions. I don't need someone telling me how to do it." Some drivers focus more on the importance of the features than on government involvement, claiming GPS is too vital to ban; others, though, believe drivers still can benefit from GPS and mapping features on cell phones even if they legally can’t access those features hands on while driving. One fan remarked, "It's more distracting than talking on your cell. Pull over!" Despite personal opinions, there’s no doubt such a ban potentially could cut down some confusion--state-to-state and otherwise--and, more importantly, distracted driving accidents. What are your thoughts? Do you support a ban on cell phone GPS while driving? Leave a comment below on your take.